Yes folks....we are those people. 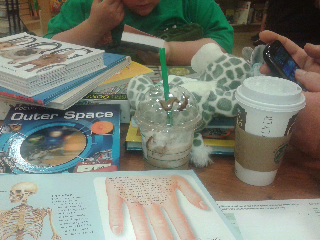 The ones you see at B&N who are sitting around for hours with kids running around :P. No I don't let them open sticker books and use up all the stickers without paying for them (at least I intercepted that from happening just now sigh). Anyway....as you can see...there is fun for the entire family..all ages lol. Its better than the library since you get coffee here and they play music and there is low volume noise and giggles lol. Anyhoo....at least our kids feel like they have actually gone somewhere and done something lol. Now to convince doug to buy me this extreme survival guide on clearance...it is 2012 afterall :p. And gotta read some Max and Ruby to Mariam :) Happy Friday!